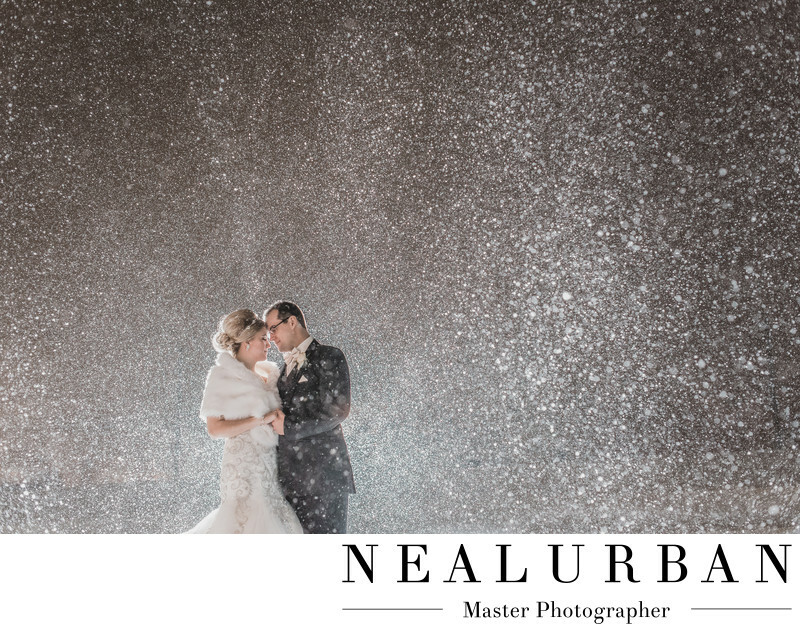 We love winter weddings here at Neal Urban Studio in Buffalo. They are not that common, but whey they come along we get so excited! Keith and Dana had a true winter wonderland on their wedding day. They were married in January of 2016. They had their wedding at Salvatore's Italian Gardens. For photos we went to the Charles E. Burchfield Nature and Art Center. It is a small park in West Seneca. As we pulled up to the park it starting snowing a ton. Keith and Dana were so excited. They really really wanted snow. Their wedding party knew this as well. We told them not to worry, we will work fast. We got some amazing images there and headed to the venue. It continued to snow throughout the evening. We wanted to take the newlyweds out for one last photo shoot. We decided to take them right outside of Salvatore's in the parking lot. That's all we needed. We placed a light behind the couple and light on the front of them. We wanted to light up the snow! The original image was full body. Neal really wanted the image to be mostly snow. So he cropped in the photo and cut off a little of their bodies. I think it was a great choice. This image is amazing! At one point there was a guest outside watching and making comments about how stupid this was going to be. On our way back into the venue, Neal showed hin the image on the camera and the guest was in shock. He apologized and said he couldn't believe that's what we just did. Sometimes we can't believe it either, but we know if we are taking a couple outside in a blizzard,it's going to look awesome! Location: 6461 Transit Rd. Depew NY 14043.